Thousands of Scientologists and their guests ring in the New Year in South Africa’s Gauteng Province at the inauguration of the stunning new Advanced Organization and Saint Hill Africa. The January 1 dedication opens the gates to advanced spiritual progress for parishioners across the Rainbow Nation and the continent. 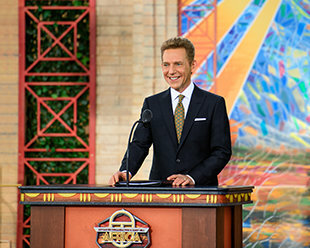 Mr. David Miscavige, Chairman of the Board Religious Technology Center, takes center stage at the opening of this new spiritual center, which serves a continent that is home to some 1.3 billion people. As Mr. Miscavige pulls the ceremonial ribbon in dedication of the new Advanced Organization for Africa, Scientologists from across the Rainbow Nation and around the world erupt in celebration. As the ribbon flutters to the ground and balloons fly overhead, the doors officially open for this new Advanced Organization and Saint Hill Africa. Sounds of celebration echo up beyond the tree tops at the dedication of a new Advanced Organization for Africa. Fifteen years ago, South Africa was the launch point for the Church of Scientology expansion program that has since opened 70 new Churches around the world. Those Churches, along with this new Advanced Organization, were established under the direction and leadership of Mr. Miscavige. JAN 1 A LOOK INSIDE THE CASTLEWith the flourish of a falling ribbon, crowds file into the grand new Advanced Organization and get their first glimpse of the glorious surroundings where they will progress on their spiritual path to freedom. Crowds attending the Grand Opening of the new Advanced Organization explore its expansive facilities. As Castle Kyalami springs to life, parishioners flock into the Hubbard Guidance Center for spiritual counseling. In the Academy—where Scientologists train to become spiritual counselors—course rooms are packed with students. HANDS UP FOR AFRICA: Exhilarated after the historic Grand Opening and energized to build on the momentum of the day, Scientologists participated in an All-Africa Ideal Convention. Singers grace the stage performing original African songs in celebration of the Grand Opening of the new Advanced Organization and Saint Hill Africa. The repertoire included songs written and composed by L. Ron Hubbard as a tribute to Africa’s indomitable spirit. And that spirit was on full display as the performers and the audience were moved—literally and figuratively—by the rhythm and the message of the music. The grand Auditorium next transforms for the IAS Patrons Ball, a black-tie gala honoring those members supporting the region’s massive humanitarian outreach. Mr. Miscavige honors over 100 IAS members for supporting the continent’s massive humanitarian outreach and acknowledges their drive and dedication in helping to make this Grand Opening celebration a success. A favorite gathering place proves to be the Acacia’s braai—a distinct South African culinary tradition mixing barbeque with social celebration—where crowds gather each day of this celebratory first week. The million and one details of the Church’s social programs are the focus of the Africa Humanitarian Crusade Seminar, Saturday afternoon, January 5. Attendees are treated to an in-depth briefing on everything that goes into implementing some of the world’s most far-reaching social salvage programs and they are ready to get to work. Situated between South Africa’s two largest cities—Pretoria and Johannesburg—the new Advanced Organization and Saint Hill for Africa in Castle Kyalami stands on the region’s highest peak, offering 360-degree views of the African Highveld. The east wing of the Advanced Organization and Saint Hill Africa is dedicated to the training and delivery of Scientology spiritual technology. This stunning new facility makes higher levels of spiritual advancement available on African soil for the first time in history. PURIFICATION CENTER L. Ron Hubbard developed the Purification Program to free individuals from the mental and spiritual damage caused by drugs and toxins, using a regimen of exercise, sauna and nutrition—all of which are provided for in the Purification Center. The Purification Center presents the ideal setting for this program and includes a detailed mosaic that depicts the Castle Kyalami bathed by a fiery sunset. Scientologists acquire a full mastery of auditing (spiritual counseling) skills in a course room dedicated to Scientology training. SOLO TECHNICAL DIVISION At the heart of the Advanced Organization is an entire wing devoted to Advanced Courses, where Scientologists reach the upper levels of spiritual awareness. HUBBARD GUIDANCE CENTER The Hubbard Guidance Center provides for the ever-growing number of Scientologists receiving services through to the State of Clear—and the upper levels of the Scientology Bridge. Each of the Hubbard Guidance Center’s auditing rooms provide the ideal, distraction-free environment necessary to achieve spiritual enlightenment. Beyond serving as a spiritual home for Scientologists, the Advanced Organization and Saint Hill for Africa is where parishioners join in the Church’s many humanitarian initiatives and outreach programs, actively dedicating themselves to building a better world. As the coordination hub of Church of Scientology-sponsored humanitarian programs across Africa, the Auditorium serves as the perfect venue for seminars and conferences. THE PROTEA RESTAURANT The restaurant, named for South Africa’s national flower, features a varied menu of local favorites and international fare. CASTLE KYALAMI LOUNGE The Castle Kyalami Lounge combines the grandeur of a royal residence with traditional African design, woven baskets, tribal-inspired woodcarvings and a color scheme evoking fire-red South African sunsets. THE OFFICE OF L. RON HUBBARD As is traditional in all Churches of Scientology, the Office of L. Ron Hubbard stands in permanent honor of the religion’s Founder. It symbolizes this Ideal Advanced Organization and Saint Hill’s commitment to forever uphold his legacy. CONTINENTAL LIAISON OFFICE AFRICA Along with the grand opening of the Advanced Organization, the Church also inaugurated a new Continental Liaison Office for the ecclesiastical management of Scientology across the region. From here, the Church guides the activities of every sector of the religion across the continent, including Scientology Churches, Missions and affiliated groups, as well as the implementation and expansion of Scientology humanitarian initiatives and social betterment programs. This new studio is fully equipped for all audiovisual production to facilitate the growing demand for Scientology across Africa. The facility further serves as a center for interfaith groups to unite in the name of continent-wide social betterment. CHURCH OF SCIENTOLOGY JOHANNESBURG The Church of Scientology has deep roots in South Africa, establishing its first Church in Johannesburg in 1957. In 2003, Johannesburg became the world’s first Ideal Organization. CHURCH OF SCIENTOLOGY PRETORIA Situated in the capital city, at the doorstep of the official seat of the national government, the Union Buildings (top, center), is the Church of Scientology Pretoria. The Church, consisting of five heritage homes, opened in 2013. Atop a plateau that Zulu tribal people once called “The Place in Heaven,” the distant beat of djembe drums became a celebratory symphony of rhythm that set a week’s worth of glorious festivities into motion. More than 4,000 guests from all over Africa and every corner of the globe had gathered at the magnificently restored Castle Kyalami for an historic Grand Opening ceremony. It was a celebration filled with pride and passion, a celebration of continental hope uplifted, a celebration of spiritual freedom and yet another milestone in the history of the Church of Scientology—a new Advanced Organization and Saint Hill for Africa. At the center of that heavenly hilltop, on 22 acres of land, the 87,000-square-foot Castle Kyalami stands in testament to the religion’s commitment to helping create an Africa that can fulfill its unlimited potential. The Castle’s presence reflects the magical aura of the South African landscape as it looks toward the nation’s twin giants of Gauteng—Johannesburg to the south and Pretoria to the north. The panoramic views quickly captivate visitors, and the Castle’s 12 crenellated turrets and eight-inch-thick walls give it a unique ambience. The elegant interior augmented by Italian marble floors, mined from the same quarries used by Michelangelo, lent its own special atmosphere to the spectacular grand opening.